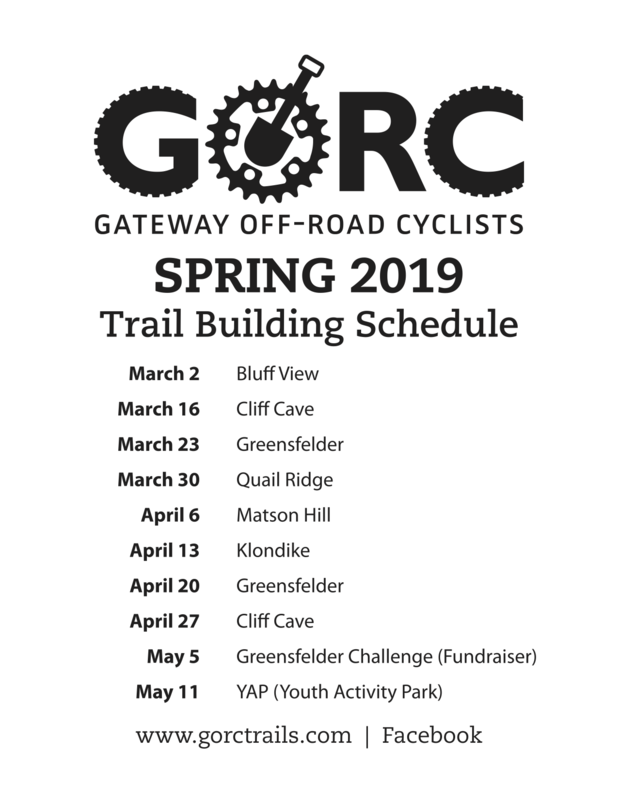 Build Plans: We will continue building the new trail starting from Donjo going north under Strip Mine and connecting to the Donkey Kong loop. Trail work will include benching on a steep hillside and armoring where needed in the loose hillside. We have a bunch of areas to fine-tune and a major length to still build. Your assistance would be greatly appreciated and this is a fun, technical park! We will be working on connecting this new section to the bottom of the start to Donkey Kong. Klondike Park, St. Charles, MO. Meet up at the shower house parking lot OR maintenance shed lot - just follow the signage! Take Highway 94 South approximately 14 miles, past Defiance and Matson. The park entrance is on the left side of Highway 94. Once in the park, make the first right turn and follow that road up to the stop sign. The shower house parking lot is on the right.